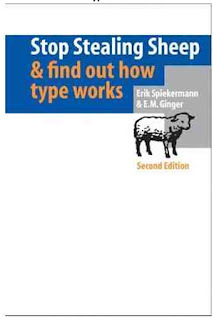 Erik Spiekerman is a highly prominent designer and the creator of the typeface ‘Meta’ and his book ‘Stop Stealing Sheep and Learn how type works’ is part of the suggested reading list for my BA Graphic and Communication Design course at the University of Leeds. This book provides a crucial incite into type and how it can be used that I would recommend to any other design student. The book starts with a very interesting anecdote which shows just how important type is to us – it talks about how western travellers often feel so lost and out of place when travelling to China or Japan because due to the different writing system, instead of being able to recognise or understand even a few phrases or words they can read nothing – not even price tags. The key thing that I took from the book was that as a designer I have to think very carefully about which face I choose for each project as to choose the face that will work the best. For example bold, highly legible face are need for road signs but thin ones used where space is a premium – type can fulfil complex demands. Different faces can also portray different emotions and have different personalities (Gill Sans wouldn’t work on a sympathy card just as Sabon wouldn’t on a 5 year olds Birthday invitation). I once wrote out an extremely rude phrase in Gothic calligraphy . . . this challenged people's expectations of the lettering and they were quite shocked. It's something to play with. I remember at the start of that typography project, we were told that we would "grow to love typography and get really excited by the huge range of typefaces available". We all found it hilarious. But it's so true... the possibilities that typefaces allow is vast. I agree with scarlet-blue's comment, in that the look of a font evokes a certain response, without necessarily reading the text. I also like how playful typography and language can be in design.